This was the first book that I chose to read for the 24 hour readathon on April 18. I was a little anxious about the readathon (it was my first time to participate in any capacity) and I decided to start with a book that I knew would be light and entertaining, and would also count towards one of the many challenges I have signed up for this year. I must confess that it took me a while to get into this mystery — not because it was difficult to understand, but because perhaps it was a bit too fluffy for me. However, now that I have finished the book and reflected on its content, I think this series is great for its genre! Having said that — there is plenty to enjoy about this book. The characters are diverse and entertaining. There is, of course, Hannah and her bakery assistant Lisa. I greatly enjoy reading about their preparations for large catered events, as I at one time considered that a possible profession. Hannah’s mother and sister also live in town and provide much humor to the story. Hannah’s mother, Delores, is fixated on finding a suitable mate for her daughter and is constantly calling her up to discuss the latest available bachelor. I really enjoy Delores’s character and look forward to watching her development! Hannah’s sister, the one who is married to the police officer, also lives nearby and they have a young daughter who idolizes her aunt. Hannah’s sister is a bit distracted with her real estate business – and in the beginning appears to take advantage of her sister and neglect her daughter — but in the end the reader sympathizes with this character and learns that she really does have a compassionate side. The potential love interest that is in the initial blooming stage is Norman, the newest dentist in town. I am sure that this character – and hopefully their relationship – will also be further developed in subsequent mysteries. I must confess that I have not really read a series before – besides Nancy Drew when I was in elementary school. I am very interested to see how characters are developed – how relationships mature – and how the reader becomes a part of this smalltown lifestyle. 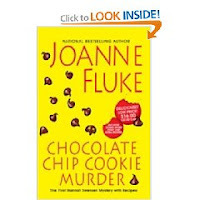 All in all I would say that Joann Fluke’s culinary mysteries are very satisfying fare. I would not want to make a steady diet of them, but every once in a while a quick read or two will certainly hit the spot. Interestingly enough, there are currently an exact dozen of the cozy mysteries published, the most recent one being Cream Puff Murder in March of this year. Being the organized, symmetrical, type-A personality that I am, I will probably read the books in the order in which they were written, which means that my next Hannah Swensen mystery will be Strawberry Shortcake Murder. Sounds like it will include some wonderful summertime recipes! Book Reviews --- Do you have a system? Cozies, literary fiction? Certainly not! Enjoyable interspersed among “deeper” books? Certainly yes. I call them literary palate cleansers. It’s tacitly understood the reader does have to suspend disbelief when reading cozies. Let’s face it, what local law enforcement lets someone poke around in an investigation? I have Cream Puff Murder on my cozy challenge list. Great review, glad you did enjoy it. Have a great week, Molly. This is a really fun series so far. I’ve read two or three of them. I think it’s a riot that someone could get info out of people with great chocolate chip cookies. I know my husband would spill any beans he had! Ironically, I’m listening to a nonfiction tape now about changing interrogation tactics at Guantanemo and Abu Graib, and in one instance, anyhow, it was a McDonald’s fish sandwich that turned the tide! Will you be trying the recipes and reviewing those, too?? I haven’t read a cozy mystery in a while, but I do enjoy them. Recipes are always an added bonus! Great review, Molly. I picked up Blueberry Muffin mystery awhile ago at a sale and then I happened to read a review on Amazon. The reviewer did not like the book at all, or the series. So I book my book on the shelf. Now I’m thinking I should check out this one you read and try the series from the beginning. I’m glad you helped me out on this. Thanks. This is a really fun series so far. Sounds like a yummy book! I have left a gift for you here. I enjoyed the first 3 books in this series. Loved the recipies. I did like the horror her mother had over her continually discovering dead bodies, not because she was concerned for her daughter’s safety, but because she worried about Hannah’s reputation :-).